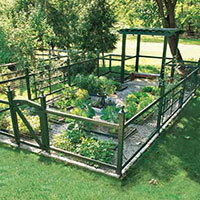 Find free vegetable garden designs that you can use to start your own amazing veggie garden! Learn tips and techniques that professionals use every day to get the best results possible. Learn how to choose the best site to start your garden, learn how to prepare the soil before you start planting, and research different designs and crops to maximize your garden's efficiency for the best yields you can get! Above Ground Vegetable Gardens: One of the many popular vegetable garden designs you can choose from are raised vegetable gardens. There are many advantages to building your garden above the existing soil level, instead of below it. Learn the Do's and Don’ts about raised garden beds and the best way to use this method to grow your very own vegetables! Companion Vegetable Gardens: Companion planting is a concept that has been around since mankind planted its first garden. 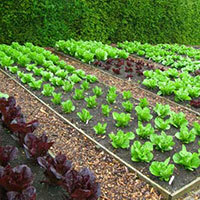 The concept is actually very simply and is widely used in many vegetable garden layouts. Learn what plants are believed to grow best together, which plants and veggies are believed to not grow well side by side, and learn the techniques that vegetable gardeners have been using for centuries. Fall Vegetable Gardens: Lots of gardeners start their vegetable gardens in the springtime, but how many do you know that grow veggies in the fall? There are actually a great many veggies that are considered cool-season crops, so starting a late year garden is very possible. If you would like more information on these vegetable gardens, or would like to know which veggies can actually be grown in colder weather, take a few minutes to browse this article. Fertilizer For Vegetable Gardens: There are many different types of fertilizers on the market today, from granular to liquid, commercial grade to organic…but how do you know which of these would be best for you? Here we will break it down for you so that you can make an informed decision on what works best in your vegetable gardens. Mulching a Vegetable Garden: Learn all about mulching a vegetable garden as well as the various options you can choose from such as organic and inorganic mulches. Mulch serves a practical purpose in vegetable gardening and we can show you the various benefits that you will gain by mulching. Free Vegetable Garden Plans: Looking for free vegetable garden layouts but not quite sure what kind of garden you want to start? 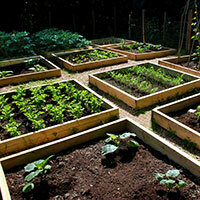 We have put together several popular vegetable garden designs that you can use to start your own garden at home. Most of the plans are simple, easy to understand plans that anyone can implement. How To Grow Vegetable Gardens: A simple, step by step guide on how to grow vegetable gardens. We will walk you through all the basics from choosing the right location, how to prepare the soil for gardening, as well as the growing requirements for many popular vegetables. Preparing Soil for Vegetable Gardens: Here we will provide you with a How To guide for preparing soil for growing vegetables. There is a lot more to growing veggies than just buying plants and putting them in the ground. Learn how to properly prepare your soil for the best results. 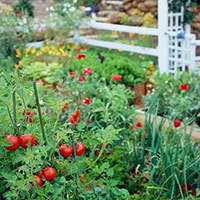 Starting Vegetable Gardens: For many people, starting vegetable gardens may seem like a daunting task. They may not be sure where to begin, where to put their garden, or how to arrange the vegetables in it. There are many vegetable garden layouts you can begin with, and we will show you a few of them here. Vegetable Garden Advice: It's one thing to have the knowledge on a particular topic, but it's a far different matter to have hands on experience. Sometimes the best knowledge you can get comes from those who have been at it for decades. We've searched out some of the most popular advice for growing vegetable gardens. Vegetable Garden Companion Planting: Learn what companion planting is really all about and how it's believed that planting the right combination of plants and vegetables together can lead to better results in all vegetable gardens. We've put together a list of combinations that you can try at home in your own garden. 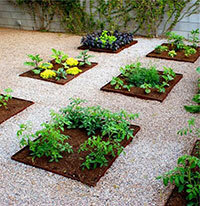 Vegetable Garden Designs: Looking for a creative way to grow veggies? People have come up with some really inventive ways to grow vegetable garden layouts that don't require the traditional "farming" look. You just might find an idea of two that you like and can use in your own garden! Vegetable Garden Diseases: Diseases are the enemy of every gardener no matter what you are growing. Learn how to identify common diseases among vegetables, and what you can do to treat them. Keep your vegetable gardens disease free by educating yourself! In the long run you will end up saving yourself time and money! Vegetable Garden Plans: Are you looking to start your own vegetable garden layouts but you are just not sure where to get started or what steps are important? We can help you get your vegetable garden plans moving in the right direction. This article contains great tips and ideas to help you get your vegetable garden off to a great start. Vegetable Garden Tips: Find great vegetable garden tips that you can take and use in virtually any garden. There are countless tips out there that you can find, but we've compiled a list of what we consider the best tips for vegetable gardening. Vegetable Garden Tools: The right tools can make your life so much easier! Working a vegetable garden can be back breaking, why not get yourself the right equipment so you can enjoy your garden as much as you work it? Here we've outlined some of the common, and some of the less thought of tools you might use. Vertical Vegetable Gardens: Maybe you'd love to have a vegetable garden, but you're dealing with limited space. There are many different garden techniques that you can use to grow your veggies up, instead of out, giving you the same great vegetables but using limited amounts of space in the process. Learn new and creative ways to grow vegetables without taking up a lot of space!